Dag Hjalmar Agne Carl Hammarskjöld was Secretary-General of the United Nations from 10 April 1953 until 18 September 1961 when he died in a plane crash while on a peace mission in the Congo. He was born on 29 July 1905 in Jonkoping in south-central Sweden. The fourth son of Hjalmar Hammarskjöld, Prime Minister of Sweden during World War I, and his wife Agnes, M.C. (née Almquist), he was brought up in the university town of Uppsala where his father was Governor of the county of Uppland. At 18, he graduated from college and enrolled in Uppsala University. There, in 1925, he completed, with honours, a Bachelor of Arts degree, majoring in Linguistics, Literature and History. For the next three years he successfully pursued studies towards a "filosofic licenciat" degree in Economics. He continued his studies at the same university for two more years and completed a Bachelor of Laws degree in 1930. Mr. Hammarskjöld then moved to Stockholm, where he became a secretary of a governmental committee on unemployment (1930-1934). At the same time he wrote his doctoral thesis in Economics, entitled, "Konjunkturspridningen" (The Spread of the Business Cycle). In 1933 he received his doctorate from the University of Stockholm, where he assumed the responsibilities of Assistant Professor of Political Economics. Although he never joined any political party, regarding himself as an independent, Dag Hammarskjöld served the Swedish Government in several posts. At the age of 31, after having served one year as Secretary of the National Bank of Sweden, Mr. Hammarskjöld was appointed to the post of Permanent Under-Secretary of the Ministry of Finance - then one of the most gruelling jobs in the Swedish Government service. He concurrently served as Chairman of the Board of the National Bank from 1941 to 1948. Six members of the Board members are appointed by Parliament and the Chairman by the Government. This was the first time that one man had held both posts, the Chairman of the National Bank and Permanent Under-Secretary of the Ministry of Finance. Early in 1945, he was appointed Adviser to the Cabinet on financial and economic problems. His responsibilities included organizing and coordinating governmental planning for the various economic problems that arose as a result of the war. During these years, Mr. Hammarskjöld played an important role in shaping Sweden's financial policy. He led a series of trade and financial negotiations with other countries, among which were the United States and the United Kingdom. In 1947 he was appointed to the Foreign Office as Under-Secretary, where he was responsible for all economic questions. In 1949, he was appointed Secretary-General of the Foreign Office and in 1951, he joined the Cabinet as Minister without portfolio. He became, in effect, Deputy Foreign Minister, dealing especially with economic problems and various plans for economic cooperation. He was a delegate to the Paris Conference in 1947, a key event in the launch of the Marshall Plan. He was his country's chief delegate to the 1948 Paris Conference of the Organization for European Economic Cooperation (OEEC). He later served as Vice-Chairman of the OEEC Executive Committee. He was also a member (1937-1948) of the Advisory Board of the government-sponsored Economic Research Institute. In 1950, he became Chairman of the Swedish Delegation to UNISCAN, established to promote economic cooperation between the United Kingdom and the Scandinavian countries. He was Vice-Chairman of the Swedish Delegation to the Sixth Regular Session of the United Nations General Assembly in Paris 1951-1952, and Acting Chairman of his country's delegation to the Seventh General Assembly in New York in 1952-1953. On 20 December 1954, he became a member of the Swedish Academy -- the body which awards the Nobel Prize for Literature. He was elected to the seat in the Academy previously held by his father. 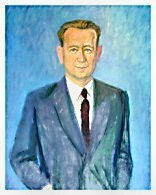 Mr. Hammarskjöld was unanimously appointed Secretary-General of the United Nations by the General Assembly on 7 April 1953 on the recommendation of the Security Council (those Member States who at the time saw him as an apolitical compromise candidate would later have reason to revise their opinion). On 10 April 1953, he took the oath of office as Secretary-General of the United Nations for a term of five years. He was re-appointed unanimously for another five-year term in September 1957-- more than six months before the end of his first term. As Secretary-General, Mr. Hammarskjöld used his good offices in a range of situations to prevent war and serve the other aims of the Charter. In the Middle East these included: continuing diplomatic activity in support of the Armistice Agreements between Israel and the Arab States and to promote progress toward better and more peaceful conditions in the area; organization in 1956 of the United Nations Emergency Force (UNEF) and its subsequent administration; clearance of the Suez Canal in 1957 and assistance in the peaceful solution of the Suez Canal dispute; organization and administration of the United Nations Observation Group in Lebanon (UNOGIL) and the establishment of an office of the special representative of the Secretary-General in Jordan in 1958. In 1955, following his visit to Peking from 30 December 1954 - 13 January 1955, 15 detained American fliers who had served under the United Nations Command in Korea were released by the Chinese People's Republic. Mr. Hammarskjöld also traveled to many countries of Africa, Asia, Europe, the Americas and the Middle East, either on specific assignments or to further his acquaintance with officials of member governments and knowledge of the problems of various areas. On one of these trips, from 18 December 1959 to 31 January 1960, the Secretary-General visited 21 countries and territories in Africa -- a trip he described later as "a strictly professional trip for study, for information", and from which he said he had gained a "kind of cross-section of every sort of politically responsible opinion in the Africa of today". Later in 1960, when President Joseph Kasa-Vubu and Prime Minister Patrice Lumumba of the Republic of the Congo sent a cable on 12 July asking "urgent dispatch" of United Nations military assistance to the Congo, the Secretary-General addressed the Security Council at a night meeting on 13 July and asked the Council to act "with utmost speed" on the request. Pursuant to Security Council resolutions, the United Nations Force in the Congo was established and the Secretary-General himself made four trips to the Congo in connection with the United Nations operations there. The first two trips to the Congo were made in July and August 1960. Then, in January of that year, the Secretary-General stopped in the Congo while en route to the Union of South Africa on another mission in connection with the racial problems of that country. The fourth trip to the Congo began on 12 September and terminated with the fatal plane accident. In other fields of work, Mr. Hammarskjöld was responsible for the organization in 1955 and 1958 of the first and second United Nations International Conference on the Peaceful Uses of Atomic Energy in Geneva, and for planning a United Nations conference, held in 1962, on the application of science and technology for the benefit of the less developed areas of the world. He held honorary degrees from Oxford University, England; in the United States from Harvard, Yale, Princeton, Columbia, the University of Pennsylvania, Amherst, John Hopkins, the University of California, Uppsala College, and Ohio University; and in Canada from Carleton College and McGill University. An authority on literature whose translations of poetry were widely admired, Dag Hammarskjöld's journal of personal and spiritual reflections was published posthumously as Markings in 1963.